Yes! Children can have foot problems too! Most people don't realize, but children can have foot and ankle problems too. The good news is, if you treat a child's foot problem early, they are very likely to succeed with treatment and not have to suffer as an adult. Children's foot problems can range from heel pain, ankle pain, flat feet, sesmoiditis, short heel cords and much more! There are a few tips to knowing if your child has a foot problem. If your child starts withdrawing from activities, if they're hiding their feet from you, or they have trouble walking or begins to trip and fall a lot. These are common signs your child has a foot problem. The other major sign...if they tell you they're having pain! You may have heard of orthotics- devices put into shoes to help correct, treat or prevent a foot problem. There are two types of orthotic, custom or prefabricated. Most often we recommend that adult with foot problems use a custom orthotic, but for a child, a prefabricated is the better option. Custom orthotics, while great, can be costly for a child whose feet grow every 2-3 months! 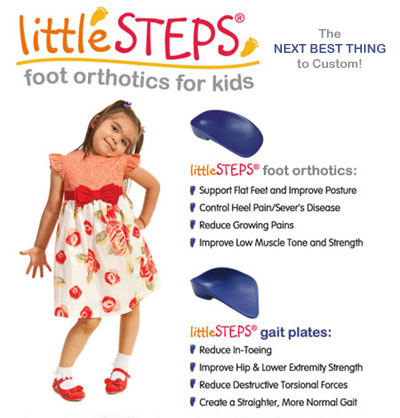 Here, we use littleSTEPS children's foot orthoses. They come in a wide range of sizes, are effective, and their kid proof! Our doctors chose littleSTEPS because it's a great product that can treat many children's foot problems. They can be effective with problems such as heel pain, instability, balance problems, sever's disease, and flat feet. If your child is experiencing pain in their feet or ankles, you need to have them checked immediately, pain is never normal.